For those unfamiliar with advanced coding stuff, please check out the easier and faster method of adding PrintFriendly to Blogger here. Goto PrintFriendly.com/button. Select Blogger/Blogspot. Choose your button style, and copy and paste the PrintFriendly code snippet. Click Check Box Expand Widget Templates (don't miss!). Find <div class="post-footer"> in template code. Tip: Press "Control" plus "F" on keyboard to search for "class='post-footer". To align your PrintFriendly button to the Right. Add inline CSS to the PrintFriendly code snippet. Step 1: Find the two <div class='pfbutton'>, inside your PrintFriendly button code. Step 2: Add style='float:right;' to the div. In the PrintFriendly code snippet, there's two images (one for list page, the other for post pages). Find the image tags and then change the src to the URL of the graphic/button you would like to use. There's two sections to the code snippet. The "Index" section adds the button to the homepage, "Item" adds the button to the post/article page. 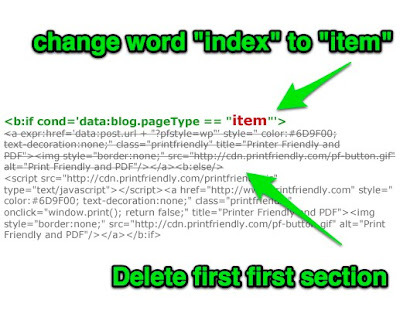 Change the word "Index" to "Item". Then, delete the first section. I added the button/option to my blog, however I would like to print only text from my blog and not the images. How do I reinstall one with this option? @Surekha, there's an option for the user to remove images before printing. After you hit print, look in the top right corner. Could you tell me how to align the button on the right side? @Miss Bethany Yes! Thanks for asking. I've now added to the guide. Let me know how it goes. Thanks for the tutorial! I added the button to my blog. I like all the features it has. Let me know if you update with more button designs/colors too! @miss bethany Yes, most definitely. Just replace the image. I see this is also is popular question. Will update the guide tonight. The PDF function does not work with Chinese text. Can someone solve the problem? Thanks. This is great! I've been wondering how to do this. This is really great! Is there any way to get around websites that require a sign in? I installed the button on a private blogger page-but when used it wants to print the google log in page. Thanks so much for this great service! Wow! I can't thank you enough. I have spent hours trying to make my blog printer-friendly and have only grown more and more frustrated. Thanks to your simple step-by-step instructions I am home-free! I appreciate your work! Oh my you are an ANGEL! Thank you for developing this! @CAHRA- @ Roberto.C What's the URL of the site? @CHINAaid Thanks for bringing to attention and welcome aboard! @Michelle Bell My pleasure. Glad it's working fine now. It works client-side so shouldn't have problems with Password Protected sites. If you experience the trouble again email me at support. Finally updated with instructions to add your own custom image. One important point-right after Step 2- Remind people to save a copy of their template, just in case the power goes down in the middle of the process, or you bumble. The instructions above for right aligning the printFriendly button seem to be referring to a wordpress blog rather than a blogger blog. Is it possible the images were flipped and the instructions for blogger are on the wordpress page? @Suzanne Thanks! :) Got "Save Template" at the bottom of step 3 after pasting the code. @YrHelper Infonut Nope, those are the instructions for blogger/blogspot. WordPress uses plugins, although you manually past similar code into templates. Thank you so much for easy to understand instructions. I do have one little issue - on the blog there is text, then photo, then text, etc....when I print the text is a bit askew and situates AROUND the photo - it is jut me? is there a way to fix? Thank you for this tutorial. The button would be very helpful to readers who print blog posts. Hello, I am in need of assistance. When I add the code to my blogger template and then go view the page and click on PDF (I chose print w/pdf button) I am getting the last post on the page as being the post that comes up. Does this button only work if you have one post one the page or did I do something wrong? div class='pfbutton' , where would I put add the CSS code for the print/pdf button? Make sure to select blogger/blogspot. For photos smaller than 50% of the page, we wrap the text (helps people save paper). In the future, we'll offer a way to customize. Howdy! When I get tried it out, I got completely random results. Your a star just like Jeff said. @The Jovial Priest Thanks for the feedback. Agree, that's an easy to miss step. I've updated the description with, "Click Check Box "Expand Widget Templates" (don't miss!). Images that are less than 50% width of the page are floated so text can wrap around. Wonky code can definitely affect what gets printed. I love this tool and I want it to work. When I use it, it only PDFs the comments. Please help. Thanks in advance! Hi, I have a problem. Maybe someone can help me? In added the Print Friendly-Button to my blog. Whenever I click on the button, the Print Friendly preview appears and then suddenly disappears. After the preview disappears I can see an empty white page. I tried different browsers (Google Chrome and Opera) to see if the browser is the problem. But it happens with both browsers. Print Friendly was unable to parse this page. my problem is than when i try to print a post with a table (made word) print friendy says "is unable to parse this page? thanks and excuse my bad english. Hi! My print friendly button was working just fine until last week. Now, each time I click on it (no matter what post I try) it kicks me off and I get the message "Internet Expolorer has stopped working" and then it just keeps trying to recover the tab. Mrs B, I get the same message. Really hoping I can get it to work properly. @Carla Try updating your browser. If you're still getting the problem, email me your site and I'll figure out. Thanks Taylor. I'll give it a shot and let you know if it works. Otherwise, I love what you've done. Hi. I have a recipe blog and I want subscribers to be able to print up only the recipes which are each separate posts. When I put this code in the way you describe here, it defaults to only the first posting I wrote. How do I get it to be particular to each post? Thanks! @Michael Ann Could you send me the URL of the page you're describing? This is weird. I got the button installed but when you hit it, it brings up totally different posts to print. Any suggestions? @Melissa what's the url? You can email support@printfriendly.com. Thanks! I'll email their help team as well. I am having issues too. I have been trying to do this for the past hour. Help! It doesn't show up here. @Jenni I'll bring back the option to put on landing page. Thanks for letting me know what you want. I love your button - thank you for it and for such clear installation instructions! I'm having one little problem. Each of my blog posts is formatted the same: photo, text, space, recipe (just text). The button seems to randomly choose to sometimes show the photo, sometimes not (the no images box is always unchecked). Sometimes it shows the beginning text, sometimes not. And sometimes, it cuts off all but the second half of the recipe. I've been able to play with the posts so that the button makes them show up correctly in the print screen, but when it finally works, I have no idea why. Could you please tell me how the button decides to cut things? I'd like to be able to have a recipe print with the text and the photo. To fix, put the image inside the same div as the content. We're also working on tweaks to the algorithm to fix. THIS NEW BOTTON is perfect in order to get or create all things we can to reach, I know it will be an excellent application for me and other users. Thanks a lot for this. Really appreciate this cool tool. Just a suggestion. It would be helpful to include as part of the print output not just the post but the identity of the author as well. This is helpful for blogs with multiple authors. Thanks. And again I must say I really appreciate this tool. If I go back and have to make a correction to my blog posting, will this software print only from the original posting or the corrected posting that is showing on the blog. I tried a different program and even if I corrected my blog, it prints to a .pdf but gave my followers only the original posting. Also, do they get a .pdf file they can save and then print or just a print out? I can NOT believe how easy this was - thank you!! Now I don't have to make separate pages for my readers to print recipes- yeah! It prints the whatever is live (latest). You can save as PDF, or Print. Yes, if you click PDF, you get a PDF file that you can save. For some reason, once you are done with the window, and you click the X to go back to the site, the page opens a new tab and reloads the Print Friendly dialogue box. It is quite odd. How do I add Print Friendly at the bottom of each individual post? @Chuck Gates I checked it out on FireFox and all looks fine. Email me if you're still having trouble. @GUT REAL Did you find < div class="post-footer" > and paste the code? @Blogger-in-Chief @ JGS Greater Orlando I updated the instructions. Now in the bottom section, "Customize" there's instructions to remove from homepage. Hi! I'm having a little bit of trouble with the Blogger code I'm using. The button is there and it works, however it doesn't highlight the whole section of info that someone may want erased. It's only highlighting some snippets of that section and sometimes you can't even highlight the wording at all. Can you help? Here's my site - www.wnydealsandtodos.com. Thanks! Fantastic product. Will use it very often. When can we expect to see it as an extension for Chrome, and other browsers? Loving PrintFriendly, it has solved a huge problem for me. I'd actually like to be able to use it correctly on the homepage (of http://herbivoracious.com) as well as the individual posts. I think you could fix it so we can pass a custom URL to the script (that I would then set with <$MTItemPermalink> or whatever it is called), so that each post on a multi-post page works correctly. That is typically how addthis, sharethis etc. do it. @WNYDealsandToDos Put the content inside a paragraph < p > tag. Then it will be selected properly. @Michael Natkin Thanks! I took a look at your site, and see you've got the general website snippet. Goto http://www.printfriendly.com/button and select Blogger/Blogspot for option 1. Just realized you are on TypePad. Will email you instructions for TypePad. Your tutorial worked fine however when I used it to test it, it generated 94 pages of what look to be blanks. Somehow it must have wanted to print ALL of my blog posts instead of just the one in which I selected to print. I don't get it. What did I do wrong? Also does the printer button have to be at the bottom of the posting instead of at the top? I was using Google Chrome and tried it with IE and the same thing happened. A spinning flower, then it showed 94 pages of blanks. @SmoothFox - Friday afternoon there was a bug that affected some users. It has since been resolved. Are you still getting the problem? It would be nice IF you had a pdf button and/ or print button for your guides. It would nice to have a verison that people can have, instead of switch back and forth between windows. It also helps when referring people to your site/blog. Thank you. In Blogger/Blogspot after the Main article how can print and the comments? THANKS!!! It works , Great tutorial! Nice tutorial!!... It works fine. When it does not work, I only see the site's footer - which doesn't appear when it does print correctly. Is there a way to print the post and the comments? No. There is not a way to include comments. Re Comment: Rats! I have a non-computer mother who likes to read the comments people leave on my poems. Either have to print everything on the page or, more tediously but cheaper, C&P the appropriate bits. Help. I'm trying to use this on my recipe blog - http://recipes.alwaysbcmom.com/ - but it only works on some of the posts. With others, such as this one, I get part of the sidebar instead of the actual post. First I manually installed the code. Then, when I found out this was happening, I removed the code and installed the widget. With the widget there was NO print friendly button.. so I put the code back - and I still have the widget. It seems that more posts (of the ones I tried) are formatting correctly, but there are still too many that want to print the sidebar - the part that starts with There's nothing like a home-cooked meal!. I'd like to add the button only to some of my posts. Is there a way to do this? Awesome stuff! I've only *just* discovered this handy tool, and have put it on my blog! Thanks so much for the work you've put into making this - I'm even adding it to my browser bar since the ability to remove images and non-essential text is fantastic and saves on ink and paper! i don't find any of the above mentioned codes and adding it myself also didn't work. The pics show an old template so maybe that's the problem? Thanks for your tutorial. I'd like to put the button on the top right only into the post page but I couldn't . I didn't find into the snippet div class='pfbutton and add style='float:right;' Where I did wrong? Thanks thingsforboys, you helped me too! I've added the printer friendly button, but when I click on "print friendly" the preview screen comes up and lists ALL my recipes to print. How do I fix it so just the 1 recipe prints and not the entire blog? That's because you're clicking the button right from your homepage. You need to open up single recipe in a page and then click the button. Hi, latest post from your blog appears to work just fine on PrintFriendly.com. Here's the direct link to the generated content. Can you possibly contact us at support@printfriendly.com and provide the URL that you were having issues with? Great tuto Taylor , it works. Thanks for the great tutoria. Only problem I have is that the layout in the pdf doc differs from the post layout in my blog. The pics, which are above the text in my post are suddenly beside the text in the pdf. Do you have any idea how I could solve this issue? Thanks a lot for your helping me! Sorry for being late in reply. Please contact us at support@printfriendly.com with your URL so that we can have a look and provide a fix for this. how do I use it in dynamic display template? Google doesn't support additional contents in the dynamic display template. But we're still working for a hack so that we can come up with something that allows us to use the button in dynamic display template. We'll write about it as soon as it's available. Please follow or subscribe to our blog (on the top right corner) to stay updated with latest information from PrintFriendly. This is exactly what I have been searching for for my recipe blog! http://www.carbs-and-fat.com - Thanks! Thank you Catherine! We're glad you find this useful. Yes, it does work with WordPress. How can I print one blog article ? i want to print a poem of my blog and not ten poems. Each poem is a new blog article. I write my poems with blogspot. Hi, I love this feature and it seems to work for the most part except for one glitch. On my home page I have multiple posts and the printer button shows up at the bottom of each post like it's suppose to. But, the print buttons don't pull up their assigned posts... they are only pulling up one specific post. See - my blog is bythelightofgrace.blogspot.com - if you click on the print button under the most recent post "Why Me?" it's pulling up a post that I wrote a week or so ago, 3 or so posts down, called 30-in-30. So I just need to get it worked out so the print buttons print their assigned post. You have to open the post you want to print first, only then the opened post will be pulled on PrintFriendly pop-up. I am Dr.R.P.Sharma. I have started a blog Sanskrit Books, Where I am posting embedded codes of books (Google drive Embedded code)please visit and observe the blog.Now, I would like to ask a question. How can I make my Blog visitors to print the content? What is our printfriendly code? How & where to insert it in my customized blogger template? Hall-freakin-llujah! This just saved me so many hours of pain and misery trying to add a proper print option to my blog that I feel inclined to dole out hugs. A.I. - If I ever meet you in person, HUGS ARE SO ON. Ha ha, that feels so great to hear, although PrintFriendly was not my idea. :P I'd still take the hugs. I use my blog for family / friends (not really general public).. but I did want to print the entire year for scrapbook purposes. Is there a way to that cost efficiently / easily? Hi, You have to manually open each individual post and print them using PrintFriendly. There is no automated way to do that. Can I use this on a typepad blog? I want readers to be able to print a post or a recipe. We're still in the process of publishing a tutorial on how to add printfriendly button to Typepad blog. But in the meantime, you can try this out if it works for you: http://support.printfriendly.com/customer/portal/articles/706413-typepad-instructions. I do not have the div class="post-footer" in my template code. Is there another code it could be under? Are you using Blogger and not WordPress? If you still can't find it, I recommend try the simpler method of adding PrintFriendly button to blogspot. Your site was not found. how do i delete? I accidentally added twice. I don't want the pdf option, is there a way to add this without it? Before adding, make sure to select Not Allow from the drop-down next to PDF. Nach vielen Suchen bin ich endlich auf diesen hilfreichen Blog gestoßen! VIELEN DANK für die Hilfe und für's ausführliche erklären! I have just tried to add the print friendly widget (both manually adding the code and automatically) but nothing happen. It's not added on my blog. Any clue? I am using blogger, the new "dynamic model"
The dynamic model doesn't allow addition of new third-party widgets, reason why it doesn't support PrintFriendly yet. This does work pretty good, however, when I turn the print file into a PDF, it splits some of the pictures between pages. Some work great and leave a lot of room before a page break, but some just get cut in two half on one page and the rest on the next PDF page. How can I correct this? Could you send your website's URL to support@printfriendly.com? We'd like to take a look. Are you using Blogger? If yes, just add the following lines of code (in HTML mode) before and after the recipe that you want to be printed. I want to add it in http://oishirecipes.blogspot.com. Whether the above tags will avoid pictures also? Do I need to define print-only anywhere? I am not very familiar with HTML, but I can edit. I am using blogger. I have to admit, it’s not something I would normally think about when designing a site, but given how simple it is to implement I might well be doing this to my own blog soon. I guess you could even change the font in your ‘print friendly’ CSS to times-new-roman. The font was designed especially for print after-all. Thanks for your suggestion. We'll definitely keep that in mind. Thanks for explaining this. We've been wanting to do some printing in Vancouver. I will have to try this out. Hi, I tried to install your print-friendly button on my blogspot website. I followed the given instructions, however, it did not install. My website is http://cookingthumb.blogspot.com/ . I have removed the code for now till I get clarity on installing it. Can you please tell me what am I missing. Thanks! PrintFriendly should have been installed on your website. What problem did you face? Did you try adding the gadget from printfriendly.com/button? I added your code as specified, however no "print" button showed up on my web-site. Can you please help me in installing it? Thanks! And let me know if it works? Hello! I was able to add the printfriendly button to my blog so that it shows up on my posts, but I haven't been able to figure out how to add it to each of the individual pages of my blogger site (that aren't posts.) In case this matters: I actually ended up having to add the code to a completely different spot in my html template in order to get it to even show up on any of my posts - I couldn't add it the way showed above or by having it automatically add to my layout. Can you try these steps again and see if it works this time? Printing friendly goes well with the term called green printing. Going through your article I recalled website a called green printing which strives for excellence in saving the mother nature for its better future. Have a look into this website and I am sure it will strike you with its features. I added the print friendly button but it prints the whole post and I want only the recipe (using Blogger). I saw the earlier comment about puttig the line code before and after ther recipe while in HTML, but how would I find the single recipe in code? Having trouble doing so..and is this something I would have to do each time I post a recipe? This should automatically insert a button on each posts. Hi -- I've seen this question above but not an answer. I've installed the button and it works fine but it will "grab" the entire page and not just one post at a time. Does this only work, then, if I have one post per page? To make sure PrintFriendly grabs one post completely, you have to open the post and then click the button. If you click the button from homepage or archive page, it will not work correctly. I hope that clears the point. Let me know if you have further questions. FROM ONE PAGE TO BE ABLE TO SELECT THE POST THEY WANT AND TO PRINT IT. CAN THEY? It's really great post informative, awesome and different article in which you have explained beautifully to add print friendly to blogger. I am layman of advanced coding languages so this post is really great thing for me. So I think so it’s very useful and knowledgeable especially for those who do not have much knowledge of coding. In every step you have given visuals with steps that made your post awesome. We're glad you find it useful! Don't forget to recommend your friend, too! Looks like you got that working after all! I cannot generate files that was too large where ie contain 300+ images, is there any solution? You mean that a page that contains over 300 images, right? Can I get the URL of it? Hi Great post..i have implemented the same in blog and it is working. Thanks for sharing this great stuffed post. how to show prnt frndly on top of article??? Please share your blog URL. Very useful features. I have installed your print-friendly button on my blog. TNK! great blog. Love your writing. I cannot print Quizlet cards from my blog. All other articles and images print. Any suggestions? I am using Dynamic template and had to used web code. This is the most excellent thing! I would really like to get the blog address to NOT be printed across the top. Is there a way to get rid of that? It doesn't show up as an element I can delete. You would need to use the Custom CSS feature. It's a little complicated if you're unfamiliar with CSS.